As the 2013 hurricane season begins, one venue in Sayreville, New Jersey, is reopening seven months after its near destruction at the hands of Superstorm Sandy. 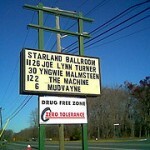 The Starland Ballroom has completed extensive repairs and renovations and begins selling tickets on June 7 in advance of a scheduled September re-open. Country star Billy Currington performs on September 7 in a much-anticipated return to music for the entire community. That return will also include AXS Ticketing as the venue’s new ticketing platform. The system is powered by axs.com, a new fan-friendly ticketing platform from AEG. 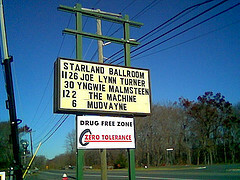 Sayreville’s Starland Ballroom is located near tributaries fed by both the South and Raritan rivers. Rain and sea surge from Sandy sent more than 6 feet of water into the venue, damaging or destroying its entire electrical and sound systems; interior walls and bars; wooden platform flooring; and plumbing facilities. More than 50 concert events were canceled or moved to other venues – effectively crushing what was looking to become the venue’s biggest year. Notwithstanding, AEG Live officials were onsite within days of the storm, deciding swiftly to begin rebuilding the facility as soon as possible. Amongst these improvements: an additional platform level in the rear of the main ballroom; upgraded, state-of-the-art sound and light technologies; and adjustments throughout the facility to improve crowd flow and sightlines. The venue’s backstage and dressing room areas also received an overhaul, while the building as a whole was reconstructed to address future storm or water issues. Nearly two dozen contractors are involved in Starland’s renovation process – mostly New Jersey residents and companies who experienced Superstorm Sandy firsthand.